Shown here (l to r) are Linda Monner, RCS Conductor; Mrs. Bass-Fortune, Principal of Chancellor High School; Chuck Parry, RCS President; and Vic Szabo, RCS Facilities Coordinator. 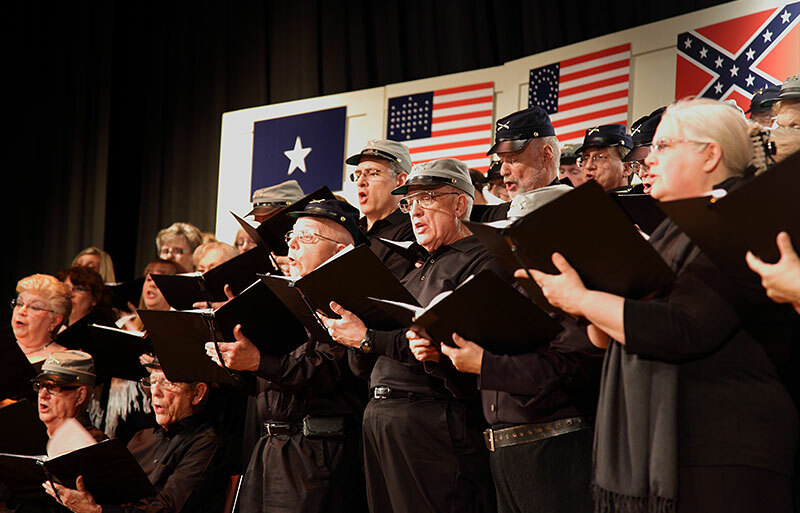 The RCS was given an American flag flown over the United States Capitol Building in honor of the Civil War Battle of Chancelorsville (held by Linda Monner) and an accompanying certificate of authenticity signed by the Architect of the Capitol (held by Chuck Parry) for their commemorative Spring 2013 performance of music from the Civil War era. 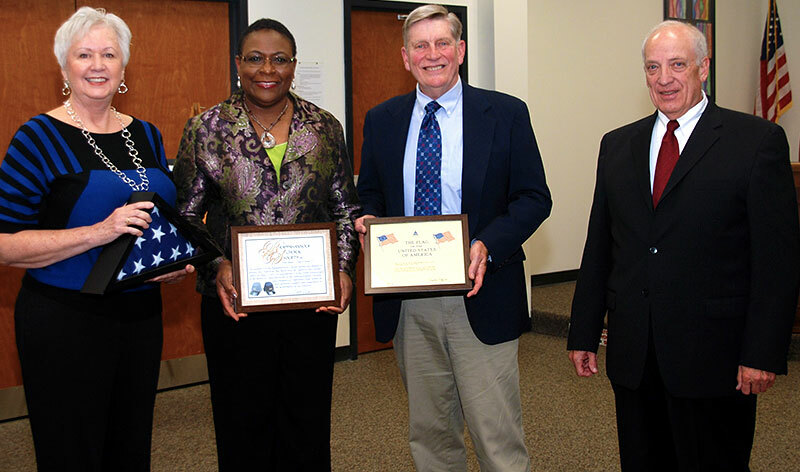 The RCS formally presented the flag and certificate of authenticity, along with a special certificate of appreciation to Chancellor High School (held by Mrs. Bass-Fortune), to Mrs. Bass-Fortune at a meeting of the Spotsylvania School Board. The school proudly displays the flag and certificates at Chancellor High School. 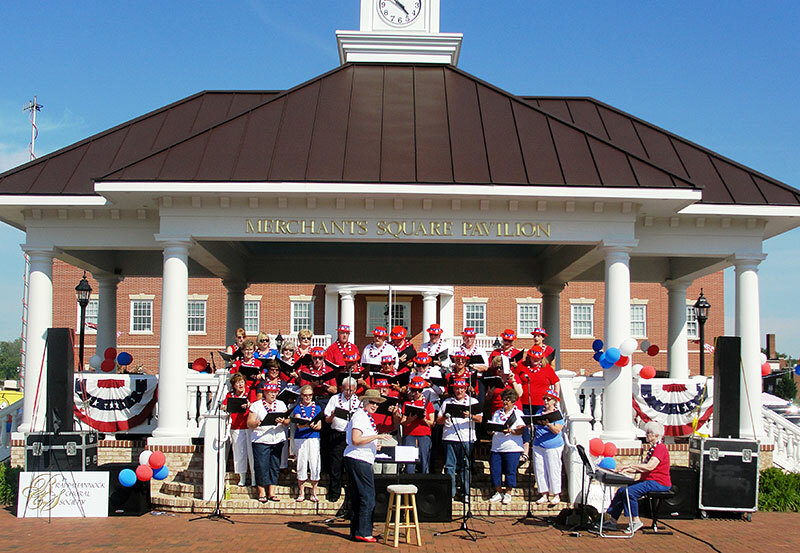 A small group singers from the Rappahannock Choral Society perform for the July 4th Spotsylvania Spectacular event. 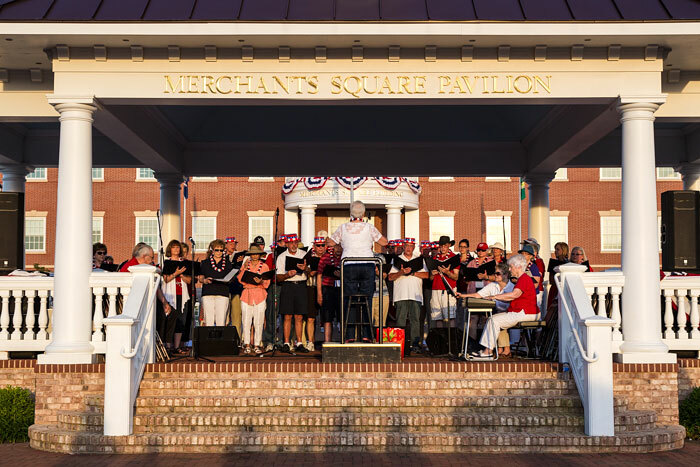 A small group singers from the Rappahannock Choral Society prepare to perform for the July 4th Spotsylvania Spectacular event. Steve Schuneman, Kent McGlone, Tim Tarzier, and Paul Farrow camp it up in their quartet during the RCS Spring concert. The RCS rehearses at Zion Baptist Church on Monday evenings at 7:00 p.m. in their Sanctuary. The RCS in performance at their Christmas Concert. The RCS in performs their Spring concert of music from the Civil War era in commemoration of the 150th anniversary of the Battle of Chancellorsville. 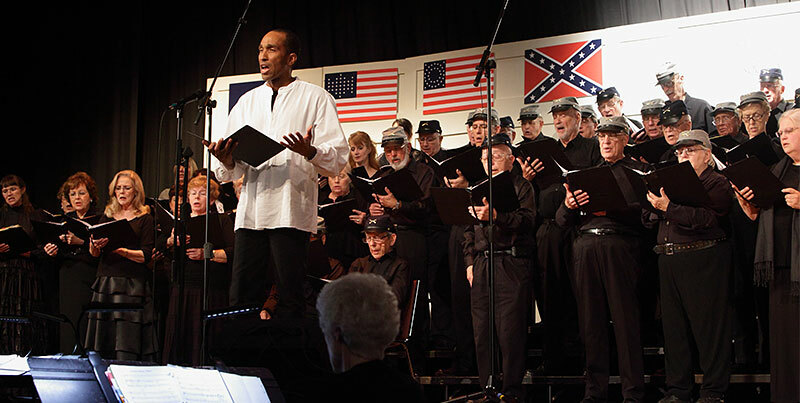 Theo Marcus, guest soloist, performs with the RCS at their Spring Civil War Commemorative Concert. 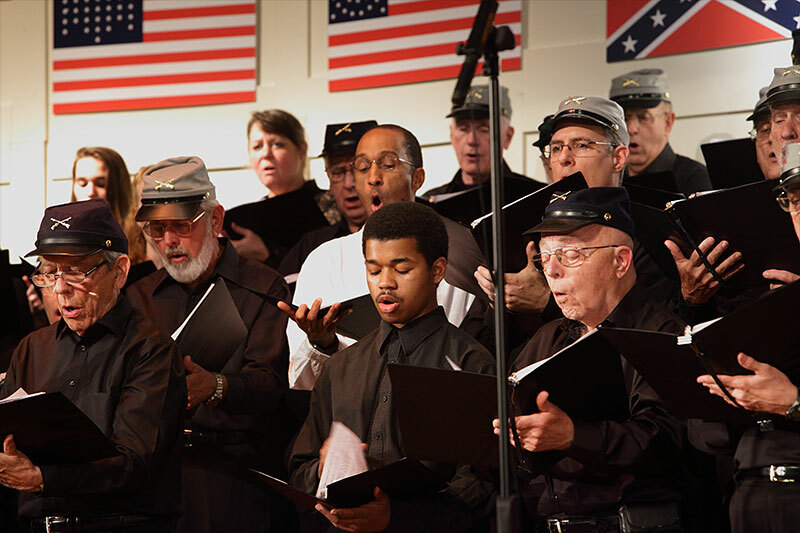 Joshua Johnson (front row center), then a high school sophomore and one of two high school students who auditioned and were accepted as members of the RCS, sings with the chorus during their Spring Civil War Commemorative Concert. 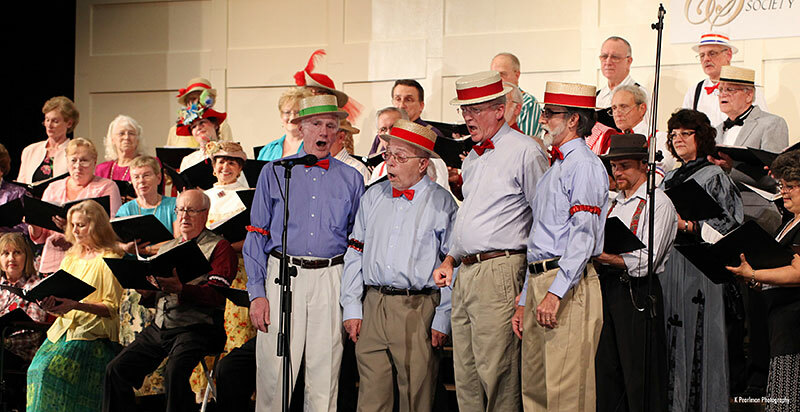 Close up of the men’s section in costume during the RCS Spring Civil War Commemorative Concert. 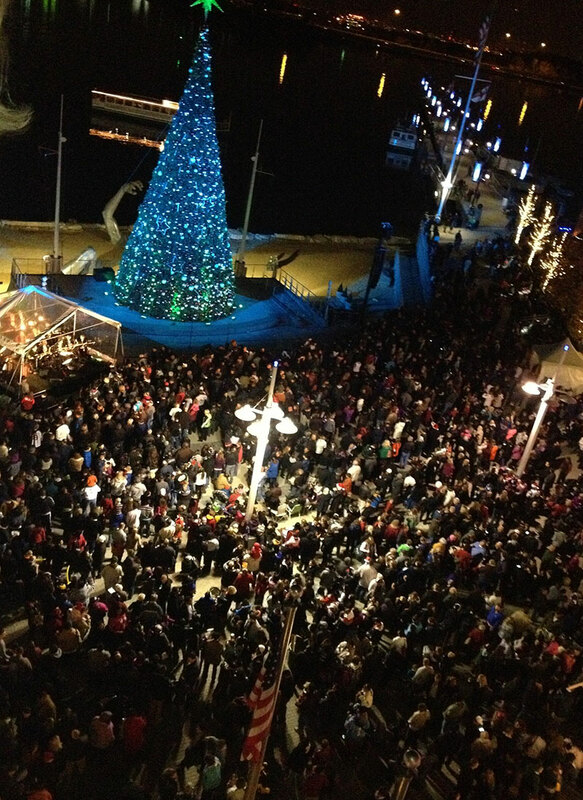 The RCS was invited to perform in front of the 65-foot Christmas tree at the at the National Harbor’s Christmas Tree Lighting Ceremony for two years. The audience at this ceremony was well over 12,000, according to the management staff of National Harbor. “e attended the Saturday evening performance by the RCS and thoroughly enjoyed it! The choir was excellent and we enjoyed every song. It was Wonderful! The Rappahannock Choral Society provides a Great Service and Gives A Resounding Gift of Love, through their Voices to the community. Thank you seems so small compared to the Great Pleasure one receives as he or she is transformed through the music to a personal place of Joy. Thank you! My husband and I just spent the most enjoyable Sunday afternoon at the RCS concert. The quality of the music was top notch. Each song was different from the last and kept the audience interested. If I had to choose one song above all of the others, it would be “Shenandoah”. They got the effect that they were trying to get- that of a flowing river, ebbing and flowing across the landscape. It was entrancing. Thanks for a wonderful afternoon!! I heard amazing things about the Rappahannock Choral Society’s performance at National Harbor last year for the big tree lighting! We are so thrilled you can join us again this year! Look forward to working with you. The choir concert was really wonderful. It must have required a lot of practice. We enjoyed it.